To install the Clock for Google Chrome™ extension, visit the Chrome Web Store, or just click the save_alt button above. The clock appears in Chrome's toolbar, right next to the address bar - that's it! You're up and running and need do nothing more! If you hover your cursor over the clock, the full date and time are shown. If you click the clock, a larger clock, the current date, a browseable calendar and details of all the reminders you have set are shown. Click the larger clock to launch a big clock, and click that for an immersive, full screen experience. Access the settings page via the icon at the bottom right of the pop up to make Clock your own. All of your settings are securely synchronised as part of your own Google profile and replicated to any computer that you use. This is really useful for say, setting a reminder up at home, and having it remind you at work. All aspects of Clock are customisable. To find out more, browse around and have a go! To modify the way Clock looks, open the options page and click "Appearance". The first checkbox shows and hides the analogue clock. The clock has two built-in default colours. Typically, Dark Hands looks best on pale themes and Pale Hands looks best on dark themes. The colour that you select here will be used to theme the pop-up window and the clock that appears on reminders. If you choose a pale colour, the background of the popup window will automatically darken so you can see the hands. If the digital only clock is selected, a new colour picker will appear. You can use this to set the colour and transparency of the digital text. NB: Setting the Digital Clock transparency to full will show a pale grey box. These options are synchronised to all the computers that you use Clock for Google Chrome on. You can change the way that the date is shown to suit your own preference. Open the options page and click "Format". Four built in time and date options are provided to suit your taste. This format is used in the hover text, the pop-up window and reminders. All other characters are shown verbatim. For example, "l eS M Y" would be "Tuesday 25th December 2018"
Normally, you will want the clock to keep time with your location (which is taken from your system time). However, you may wish to use clock in a different timezone. The Time Offset option sets the clock forwards or backwards by the specified amount in half hour increments. The clock is updated automatically as you change this setting and you can choose any offset up to twelve hours forwards or backwards of the system time. Along with all other settings, these options are synchronised to all the computers that you use Clock for Google Chrome on. Open the options page and click "Reminders". Use the slider to set the volume for the alarm sound. Leave it all the way to the right for full volume. If you want to change a reminder, click the pencil icon, make the changes and 'Add New Reminder' again. When the time for the reminder arrives, the selected sound is played and a notification bubble is shown. By clicking 'Close' on the bubble, the reminder is dismissed and the sound stops. 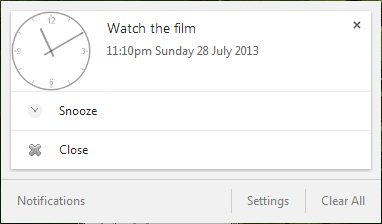 If you click 'Snooze', the sound stops and the reminder is rescheduled for five minutes after the original time. If you can hear the sound, but can't see the reminder, see if Chrome has minimised the notifications to your System Tray. Remember, all the reminders you set are automatically synchronised to all the computers that you use Chrome on. For the extension to sound a tone every hour, click the "Hour Chime" clock. Use the volume slider to control how loud the hour chime should be. Why can't I see the Clock? Make sure that the extension is installed and enabled, make sure that the analogue and/or digital clock are enabled on the Appearance page, make sure that the button is not hidden (via chrome://extensions) and try making more room for extension buttons by dragging the right edge of the address bar to the left. Why can't I set a reminder? Make sure that you have set a time in the future for the alarm to sound. Setting a time in the past will not cause a reminder to be created. Via the Chrome web store. Here you can report bugs, suggest improvements and ask anything you want. Will this extension wake me up in the morning? Possibly. But for that to work, you'll need to set a reminder and leave your computer switched on within earshot while you sleep. So if your computer goes into standby, you oversleep and miss your train/interview/breakfast, I won't be held responsible. I recommend an alarm clock, reliable family member or special friend as a more robust solution. It makes very heavy use of the HTML5 Canvas element and some maths to draw the clock. A full description can be found here. This, coupled with the native Chrome extension, notification, alarms and storage sync APIs gives you what you see. I always hide the task bar on my computer and the only thing I miss is being able to see the clock. So I wrote an extension to fill a gap. Over the years, features have been added based on user feedback and improvements in Chrome's features. Are you a group of developers? No, there's only me and this is my hobby. So I might be busy with RealLife® sometimes which means that whilst I'll do my very best to get bugs fixed as soon as I can, it might not always be immediate. Nearly all of the languages that Chrome supports. The language will be automatically set according to the system. If you find problems with the translation and would like to make it better, please let me know. I'm feeling altruistic, what do I do? Will this extension create World Peace? Yes, yes it will, just give it time.